When you get up in the morning and go about your business, it’s never clear what’s going to happen. I starting cleaning out the trunk of my car at about 11 or so and that's when I saw him. 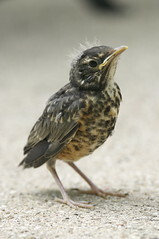 He was part robin, part fuzzy baby and no tail to be seen. Half a robin. He jumped up to me, cheeping, contemplating and staring. Very clearly he was asking, "Are you my mommy? Just feed me!" but there was a sweetness there too. He came right up to my toes, cheeping at me. 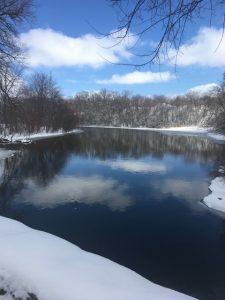 I did what anyone would do: I rushed to the Internet and found the number for the local Forest Preserve's Nature Center. 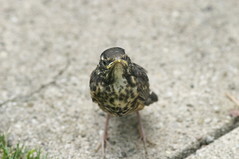 I called and a guy told me that fledglings get out of the nest and fly around on the ground. They still need their parents to feed them but since birds are very auditory and visual, the parents would find their baby. So I left the birdie. The parents would come. They never did. The short hours passed and he stayed in one place, not moving. Fledglings need to be fed every twenty minutes. It was now two o'clock and he looked like a tiny statue. He was doing what all animals do when the time comes…he was preparing to die and wasn't going to make a fuss anymore. That was it. Screw the Red Oak Nature Center guy. Screw them all. Someone, somewhere took care of ailing wild birds. So I hopped back to the Internet and found the Fox Valley Wildlife Center. Why the Red Oak Nature Center never gave me this number, I shall never know. Anyway, I called them and after what seemed forever (45 min.) they called me back. Bring him into Elburn, they would see what could be done. I found a box, Jeff and I bundled him in and I sped off. I plowed into rush hour, hitting every light on Randall Road and trying not to swear like a sailor. It took another 45 minutes to get out there to Elburn. Worse and worse. This little guy was going down and I prayed and I prayed even more that he wouldn't die in the car. Dear God, not in rush hour, do not let this baby robin die in this car. The implications for what that could mean seemed too terrible (they still do). I got him there still barely alive and the lady whisked him off, telling me he had a 50/50 chance. I gave them some money and went home with a terrible headache and a number to call tomorrow to see if he had made it. I guess the truth is that I didn’t let that baby bird die. He might be dead but I gave it my best shot and instead on dwelling that I lessened his chances for life by trusting someone at the Nature Center, I’m seeing I persisted and saw that he got to the right place in the end which was the Wildlife Rehabilitation Center. I did take care of him and simply didn’t let him pass away back into the earth. And if he passes, he does. I prayed for him and his little soul and I feel that was good. Animals aren’t like us. It was terrible to see him starve and grow fainter and fainter but it wouldn’t have lasted very long and then he would have been gone- a very short life and short death. As it was, I gave him a possible retaliation of life to become a jaunty robin who does jaunty robin worm things. We’ll see tomorrow if he was able to hang onto being here. And instead of grinding myself into the dust that I didn’t question the Nature Center sooner when he was cheeping and hopping around and being friendly, I have the calm belief that I did aid him. I had to see that his parents wouldn’t come and they never did. I know now, of course, how to deal with a fledgling and how many hours they have from not being fed till when they start dying and where to take them in-between those small short hours. He has a little number and tomorrow I’ll call that forest preserve house in Elburn and see the status of his little number. I hope, of course, for life. I’m really hoping for life and I know that I worked towards it and not to death. And now today, I just got the call back an hour ago from the Wildlife Center. He's doing just fine. Since he's wild and a baby animal, he could still die but he's hanging in there and it looks like he'll make it. They're going to be hand feeding him for awhile! I just want to say how amazing the Wildlife Center is. That anyone would care about wild animals and tend to them is an enormous gift. I would encourage everyone to find your Wildlife Center and make a donation, be it food, money or weeds! Ours is entirely dependent on donations and seem to need a bit of everything. I'm sure it's the same with other places. They are incredible, hard-working places.